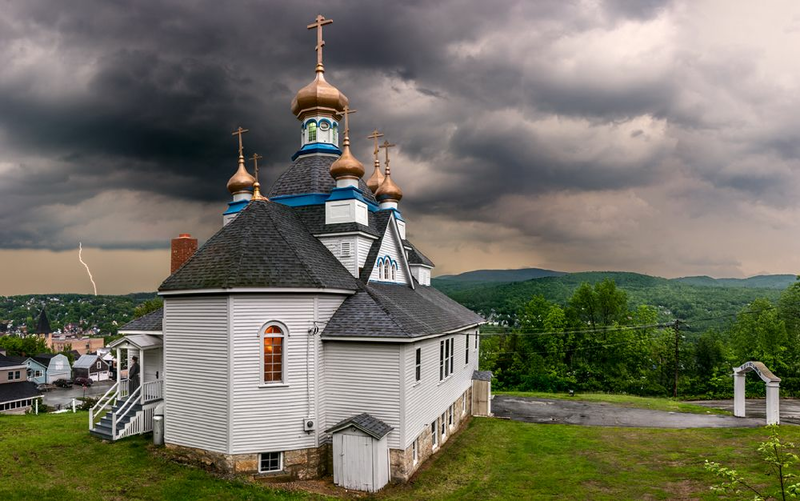 Location: Berlin, New Hampshire • Date: 6/1/11 • Standard Print (w & h): Image: 62.3" x 39.0"
This image of the Orthodox Church on Petrograd Street is composed of 18 individual shots taken at 70mm. I had been in Berlin since the day before and had been looking at this church, which perches on a hill on the west side of the city, since I arrived. After asking permission, I shot at 7:00 AM from the porch of the Rectory further up Petrograd Street. As I was taking the photographs, the storm, which had been brewing for a while, broke.